"Throw summer's fresh vegetables into a pot and stew them up for an antioxidant-packed, Southwestern-flavored treat. Black beans also have fiber, folic acid and cholesterol-lowering activity." Heat oil in medium pot. Add onion, garlic, chili powder and cumin. Saute over medium heat until onion is soft, about 5 minutes. Add remaining ingredients (except garnishes) and stir. Bring to a boil, then lower heat and simmer 20 minutes or until vegetables are soft. Add more liquid if needed. Serve alone or over rice (preferably brown). Garnish if desired with any of the following: reduced-fat cheddar cheese, onion, fat-free sour cream, guacamole, fresh cilantro. 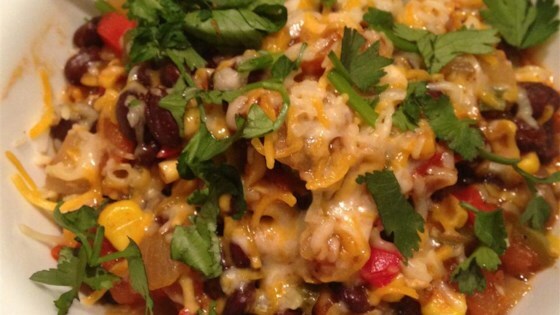 See how to make a simple chili with beans and loads of veggies. can slow cook with dried beans: assemble & soak overnight, then crock for 6ish hrs on high. Very good! Even my meat-loving family members simply loved it! This recipe was delicious and so easy to make. My husband loved it, and anything that can get my husband to eat more veggies is wonderful! This is a great recipe. I ususally use a can of black beans and a can each of light and dark kidney beans. I also use both a red and green bell pepper and sometimes add a cup of corn.